By now, pretty much everyone has heard about how Comedy Central star Nathan Fielder opened his personal version of a Starbucks in an L.A. strip mall. Fielder’s “Dumb Starbucks” looked just like a real Starbucks – same logos, colors, store layouts, and similar products and menu. With the exception that everything was preceded by the word “dumb”, including the “Dumb Blonde Roast” coffee and the “Dumb Norah Jones” CDs on sale by the register. Also, the coffee was free. Fielder kept his involvement under wraps at first. But by Monday he revealed his ownership, and by Tuesday the L.A. County Board of Health had shut him down for operating without a license. And yet, while Dumb Starbucks lived, it created a sensation, with lines snaking down the street and Fielder invited onto Jimmy Kimmel to talk about his adventure. Fielder’s use of Starbucks’ trademarks, and his mimicking of the interior design of Starbucks’ shops (yes, distinctive interior designs can be trademarked as well) seems to give Starbucks ample opportunity to sue. But in recent years, courts deciding trademark cases have been gradually expanding the scope of fair use – that is, unauthorized uses of others’ trademarks that would otherwise be illegal, but are excused because they serve some overriding social purpose. In particular, judges have held that use in parodies – especially using a trademark in order to criticize the business that the trademark represents – are widely permitted. A great example involves Louis Vuitton handbags. A pet products company named Haute Diggity Dog marketed a handbag-shaped “Chewy Vuiton” dog toy that mimicked LV’s famous marks. Louis Vuitton, which very aggressively enforces its trademarks, sued. But it lost – a federal court held that the Chewy Vuiton dog toy was a successful parody, one that was unlikely to fool consumers into believing that it was actually produced by or otherwise connected to Louis Vuitton. Fielder is doing something similar here – sort of. As Fielder made clear both in the “FAQ” posted in the Dumb Starbucks shop and in this amusing video, Dumb Starbucks isn’t really a coffee shop – it’s a piece of conceptual art. And the concept has something to do with trademark law and the nature of parody. Fielder is probably wrong about his parody defense. Since he is not really parodying Starbucks, but instead the idea of parodies, his defense is not that great and we wouldn’t bet on him winning on that ground. But that doesn’t mean Fielder should lose if Starbucks (unwisely, we think) decides to sue him. Trademark law is fundamentally based on protecting consumers from being confused about the source of a product. Fielder’s Dumb Starbucks confused no one. For one, despite looking like a Starbucks in every way, literally everything had the word “dumb” appended to it —even the CDs for sale. 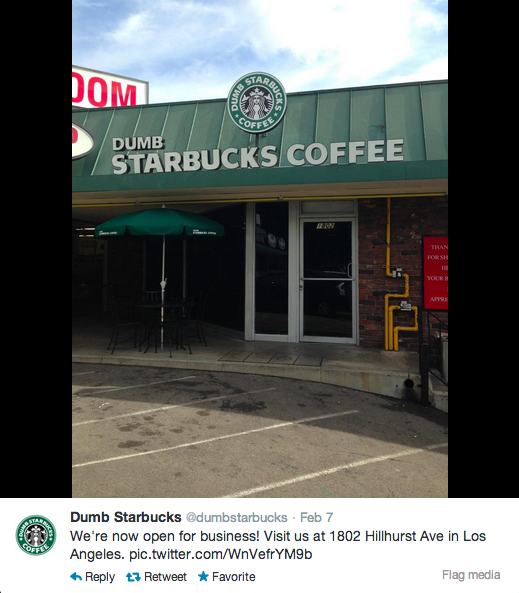 In addition, Fielder did not take over an existing Starbucks and add “Dumb” to the signage; he used a formerly empty space. So no one headed to the local Starbucks, and by accident discovered Fielder’s art project. And of course the coffee was free — something that Starbucks as a rule does not do. Add in the fact that waits for coffee were well over an hour, and it is hard to imagine —especially in a savvy hipster neighborhood like Los Feliz — that anyone really thought they had wandered into a strangely-crowded and vandalized Starbucks. It may be that Starbucks can claim that Fielder “tarnished” their brand, which is one other way of winning a trademark action. But it’s hard to see how Starbucks’ brand is really tarnished by what Fielder did. The typical tarnishment case involves the use of a trademark in a way that’s likely to saddle the mark with unsavory associations. But what Fielder has done with his Dumb Starbucks is a joke. And the only way Starbucks will be hurt by this is if it decides to sue rather than laugh. Fielder, not "Fielding"...but the guy's amazing. He's gone viral multiple times (see his staged "pig rescuing goat" on YouTube). He's talented at highlighting the absurdity of business and shows what a marketing department can do if there was no bureaucracy or legal department to slow it down. I'm curious what Starbucks' reaction would have been if this stunt was pulled by Dunkin' Donuts or Caribou...and not a Comedy Central host. Considering the amount of attention (social and media) that this achieved, perhaps a good use of marketing dollars for Caribou or Dunkin' would be to set up their own "Dumb Caribou" or "Dumb Dunkin" and threaten to sue! I must be dumb too, what was the point? I would guess it's a dig at Starbucks who make crap at a high price based more on their image than the quality of their product. If my interpretation is correct the joke is on the customers more than the company. Dumb Starbucks might fool a blind person with no sense of taste. If a $5 a day 500 calorie latte is'nt dumb I don't know what dumb is. Starbucks is the fastest way the get fat and broke. I wish this little joke would wake people up. I think it is worth pointing out that the legal standard for trademark infringement is not "whether there was actual consumer confusion". The standard is that there is a reasonable "likelihood of confusion". I wrote an easy to read legal analysis of this story on my blog. I think anyone interested in this story would enjoy the read! The Venn diagram of law, art, entertainment and public relations has a serious overlap in regard to this incident. If I were Howard Schultz's non-lawyer best friend, I'd advise him to roll with "Dumb Starbucks," treat it as a conceptual art project and let the whole thing pass. If he goes to court and wins (which, as you suggest, is not a sure thing), Starbucks still loses because it looks (outside the courtroom) like a corporate idiot. If Starbucks loses, it looks doubly like an idiot. But then, I'm not a lawyer. How likely is this parody to take off as a real business? No chance at all, so Starbucks would be smart to embrace the silliness and welcome the free publicity. Figure a way to parody the parody and boost sales. Here's and idea: offer $1 off coupons at "Smart Starbucks" -- call them "Smart Starbucks Bucks. Get the comedian to do the advertisements. This could be a marketing goldmine. Why waste money suing when you can use it to push sales? I think it was great. Perhaps next time he can do a Dumb House of Representatives? « Previous PostWhy Do People Fear G.M.O.’s? Next Post »A Safe Hitchhiking Model?